Like to mix things up? There won’t be a better opportunity to network, relax, and learn than at iGB Live 2018! 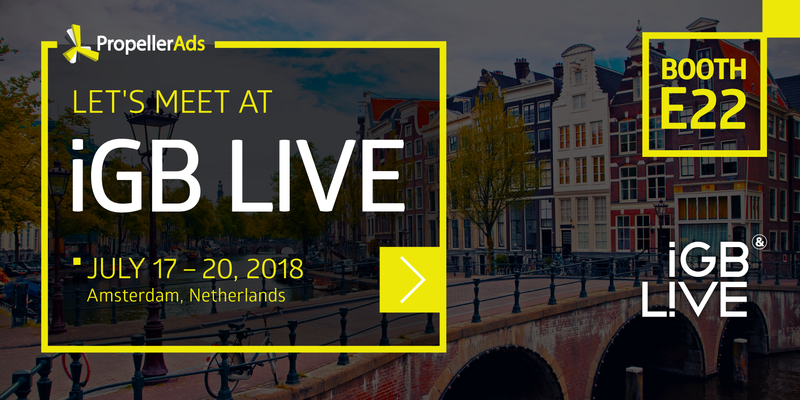 On July 17-20, gaming and betting affiliates are gathering for the biggest occasion on their calendar – iGB Live – a three-in-one event that combines at once: iGaming Super Show, EiG, and Amsterdam Affiliate Conference. Organizers claim iGB would become “the biggest dedicated igaming exhibition and conference in the industry” with more than 5000 attendees. Check our post to find more affiliate events to attend. Seriously a lot of networking. Expect to see top industry players and key influencers. Education sessions that make up the majority of programming, including keynotes from the most renowned industry speakers. New product releases from the prominent gaming and betting companies – something you don’t want to miss. What is PropellerAds taking to iGB? PropellerAds is heading into an exciting phase with many new launches lined up for this summer, and you can have a sneak peek of the products we will be introducing. Native Push Notifications – a new generation of ads and an ultimate channel for performance marketing. Native Interstitials – a surefire way of grabbing attention. Native Ads (Widgets) – the most natural way to promote content and products. And a great many new targeting options, bidding models, and various optimization features. Found something you were looking for? Ask one of our representatives for details, advice, prices, and learn how our ad solutions can make the greatest impact in promoting your company and offers! Make sure to pass by our stand or book a meeting with our team, so we can dedicate more time to you.